Should We Worry About Jackson? In an all-around sense, Austin Jackson is an excellent baseball player. He’s well above average in the field no matter what statistic you look at or if you’re just a person with eyes and he’s also very good on the bases. His offense will be the difference between solid-starter and perennial all-star, so it will be the subject of this post. 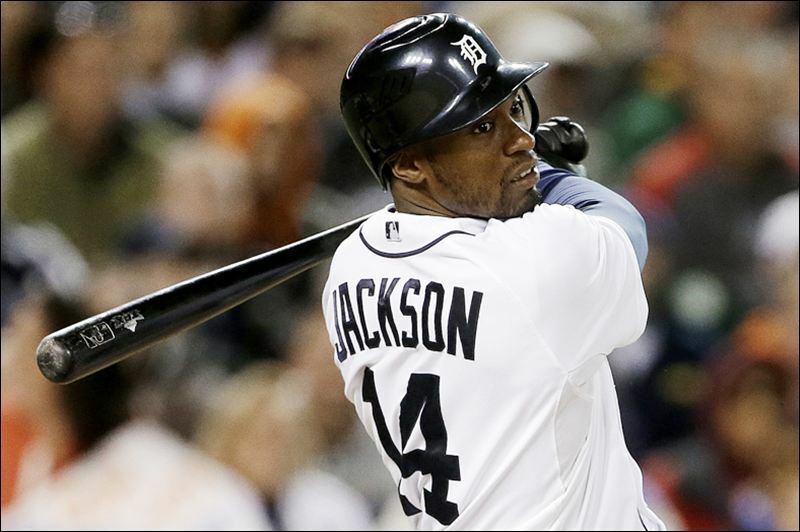 Hey @NewEnglishD we know Austin Jackson is striking out more, but you've got the real reason he is struggling right? With solution as well? While Cam and I are friends and he’s an occasional guest on New English D Audio, he’s hit on my role in the Tigers blogging community. Apparently, I’m the guy who finds out what’s wrong with players and tells you if you should worry or not. That’s fine, I’m on board. So first, is anything wrong with Jackson? He’s on pace for something like a 3.5 WAR (what’s WAR?) season, which is very good, but it’s not quite like the 5.2 mark he posted a year ago. As I said before, the defense and baserunning are in line with his normal production, so it’s all about the bat (once we’ve corrected for his DL time). 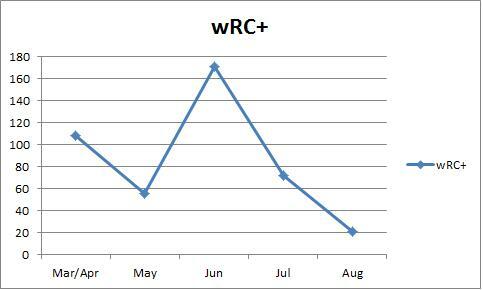 Let’s start with some simple season by season comparisons of his AVG, OBP, and SLG and then we’ll use wRC+ (what’s wRC+?) to compare him to league average. Remember 100 is average and every point above or below is that percent better or worse than average. So the basic story is pretty clear. In the context of 2012, this year looks bad. In the context of the rest of his career it looks fine. Is he around average or is he a star? That’s our basic question. He’s been a very high BABIP guy (what’s BABIP?) 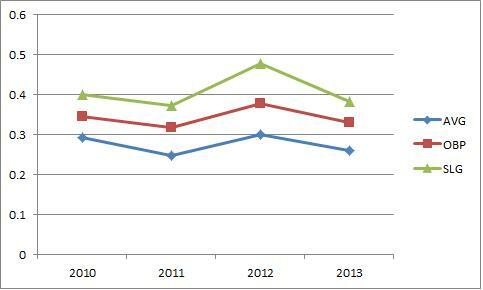 in his entire career and these overall numbers trend along with BABIP. 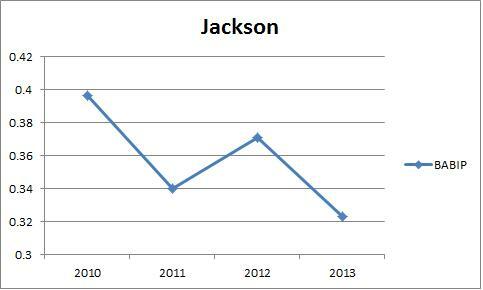 So the issue with Jackson is that he’s hitting below his established BABIP. Now BABIP is a pretty fluky stat in small samples, but line drive hitters are usually above average in this department and he has always been a guy who maintains a big number. He’s closer to average (about .300) this year than ever before. Is that to blame and is that his fault? He hit well in April, struggled a little in May before the DL stint, played well at the end of June and hasn’t been great at all in July and August. Since July 1st, he’s hitting .215/.257/.356 (.280 BABIP). That’s not very good. Before July 1, he was .290/.374/.401 (.348 BABIP), which is very good for a CF, especially one who plays the rest of the game so well. So the question is this. Is the first half Jackson the real one or is the second half Jackson the real one? Or is it the combination of the two? So keep in mind the varying sample sizes. Look at April and July most carefully. He’s hitting the ball in the air instead of hitting in on the ground and on a line. Remember what I said about BABIP and line drive hitters. Jackson will be more successful when he hits line drives and ground balls, so this correlates perfectly with the results. Jackson is performing worse because his BABIP is lower which is lower because he’s hitting the ball in the air more often. This is pretty straightforward, so now the question is if this is something Jackson is doing differently or if it’s just random noise that will correct itself. 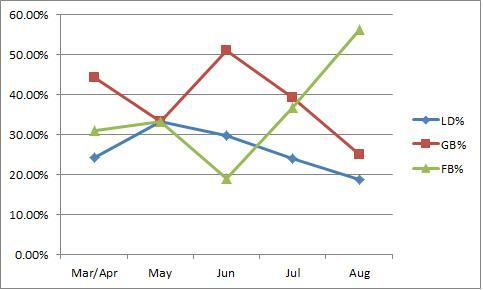 He’s hitting fewer balls to the middle of the field and is using left and right more often since July 1. Remember the sample size is different, but the void up the middle is clear. 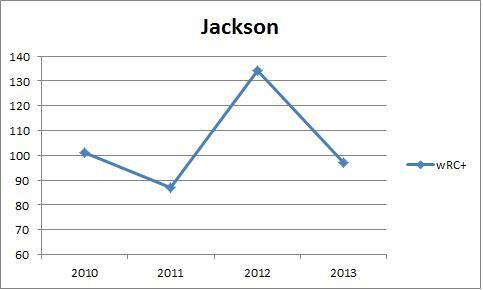 Jackson is striking out more, but he was well below his career average entering July so you had so expect some change. As for the balls in play, it looks like he’s hitting the ball in the air too much and not back up the middle as much. To me, this is just an approach thing that needs a little work. Jackson has the contact and pitch recognition skills to square up a ball, he’s just not doing it right now. With a little work with the hitting coaches, he should be able to get himself back on track. His swing can get long at times, and I think that’s all this is. Baseball players will go in and out of this kind of thing. To me, it doesn’t look like this is basic random variation. I think there is something a little off with his approach, but it doesn’t look like something he can’t fix. We’ve seen him come out of stretches like this without a problem. Despite the streak, he’s still a league average hitter and an above average everything else. Jackson is slumping a little, but nothing that can’t be fixed.